I’ve been on a search for the perfect green smoothie; one that’s full of healthy, fresh ingredients and is naturally sweet and filling, without the bitterness that is sometimes associated with green smoothies. Recently, I found my perfect combination, and I was inspired to transform it into a frozen treat that my whole family can enjoy. 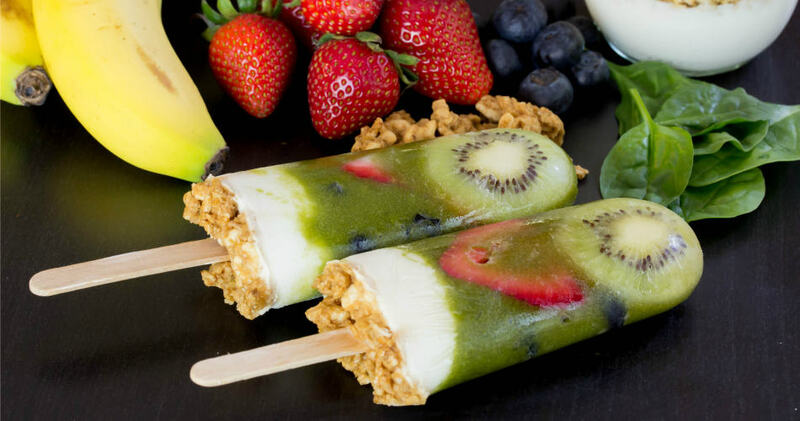 We love popsicles in the summer, so these Green Smoothie Parfait Pops were a hit with everyone! The best part is that they can easily be customized, and they are packed with dairy protein from milk and Greek yogurt. I have a son who struggles to meet his daily protein requirement, so I’m always looking for creative ways to incorporate some of his favorite sources of protein. Six ounces of Greek yogurt typically contains 14-17 grams of protein, which will leave you fuller longer! It’s creamy, healthy and delicious too. I don’t add any additional sugar to this recipe, but you could add up to one tablespoon of honey, agave or sugar, or even a medjool date. 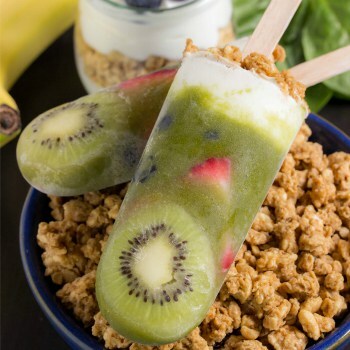 Have fun layering these healthy pops any way you like! Add a granola layer in the middle or a yogurt layer at the top. Kids especially will have fun getting in on making (and eating) these pops! In a high-powered blender, mix the spinach, milk, juice, pineapple, mango and banana until smooth. Stir together the Greek yogurt and milk. Top the green layer with the white yogurt layer. Sprinkle with granola, if desired. Notes: Popsicle molds come in all shapes and sizes, so please note that you may end up with less or more servings from this recipe. No popsicle mold? No problem! Pour the mixture into small wax-lined paper cups (such as Dixie cups). When you're ready to enjoy, simply peel the paper cup away. Also, feel free to change up the sliced fresh fruit to your liking, but you should really try to stick to using a combination of pineapple and mango for the green layer, otherwise your green smoothie may look more brown (if you swapped for strawberries and blueberries, for example).